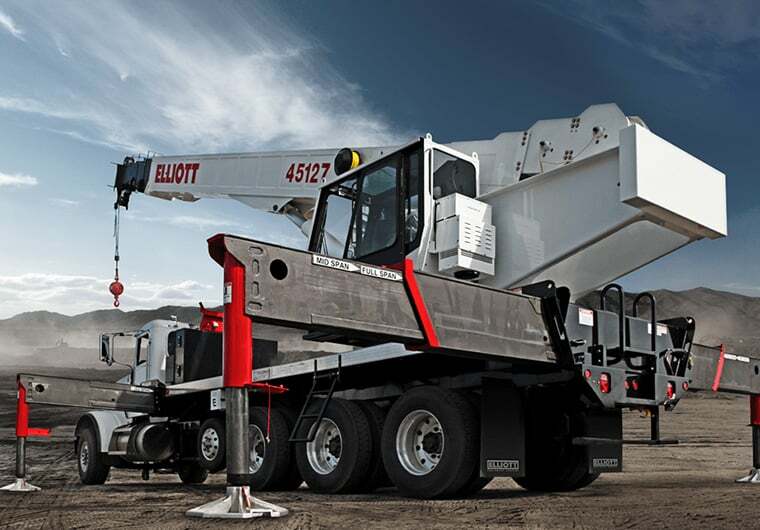 Elliott’s BoomTruck line has the most diverse lineup of models for lifting materials and personnel on the market. 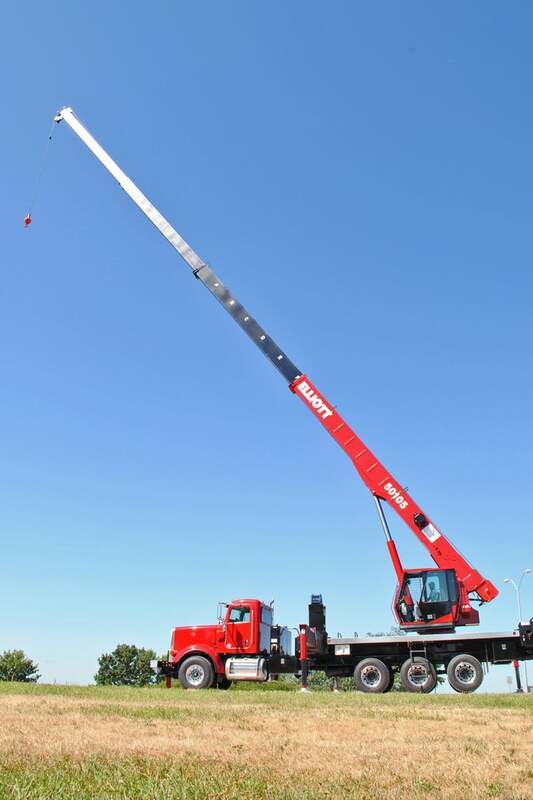 It features a range of rated capacities from 10 to 50 tons, with a wide range of boom lengths and tip heights up to 207 feet. Working with Elliott sales and engineers to select an array of standard and optional features allows companies in virtually any industry to customize the best equipment for their applications. 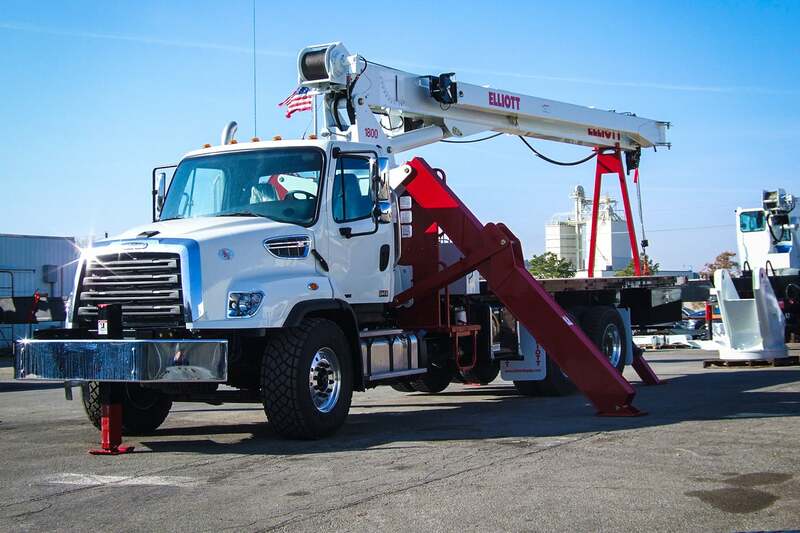 Available options like telescopic jibs, detachable work platforms and wireless remote controls, and even an available digger package mean that Elliott BoomTrucks are about far more than lifting materials. 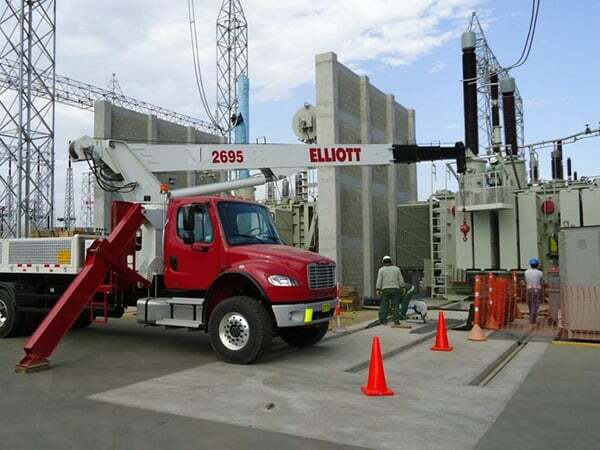 While remaining versatile, Elliott BoomTrucks are qualified for even the most specific applications, from setting trusses, lifting coil tubing, working dockside or raising materials to height. High-capacity, single-line pull winches let you lift more weight on fewer lines of rope and a two-speed winch improves lift control and reduces cycle time. The jib extends smoothly and simply and, once your load is in place, the load swings freely via an available glide swing and brake or a rotation gear as needed. Operators can be assured of comfort and ease-of-use, too, whether on the ground or in the air. Patented features like Elliott’s Standup Ride-Around Control console, seated controls and enclosed crane cab were designed with worker comfort and safety in mind, helping to increase productivity and reduce the time spent on a single job. A number of custom options for further enhancing operator ergonomics, such as crane cab air conditioning, are also available. Why Choose an Elliott BoomTruck? Start with what you need in a boom truck. Other equipment manufacturers might try to mold your needs to their equipment, but at Elliott Equipment Company, we work with you to engineer the most hardworking equipment for your particular job-site requirements. Whether it’s specialized rail gear, high-capacity digging equipment, a mounted welder generator or a huge array of other features, we’re here to customize the right piece of equipment for your application. And while the features of your BoomTruck crane may be unique to your work environment, the foundation on which we build all of our equipment remains the same. Our full-length, heavy-duty subframe is designed to disperse stress and maximize chassis life. In fact, all of the high-quality components that go into our cranes are designed to maximize service life and resale value. That is why we’re able to back up all of our equipment with a lifetime structural warranty. Interested in speaking with an Elliott representative about BoomTrucks?